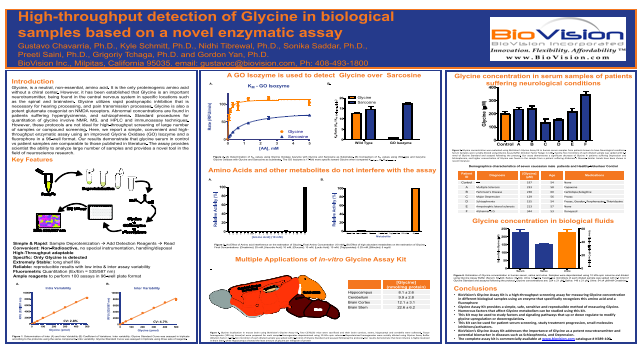 Author(s): Gustavo Chavarria, Ph.D., Kyle Schmitt, Ph.D., Nidhi Tibrewal, Ph.D., Sonika Saddar, Ph.D., Preeti Saini, Ph.D., Grigoriy Tchaga, Ph.D. and Gordon Yan, Ph.D.
quantitation of glycine involve NMR, MS, and HPLC and immunoassay techniques. • Glycine Assay Kit provides a simple, safe, sensitive and reproducible method of measuring Glycine. • Numerous factors that affect Glycine metabolism can be studied using this kit.